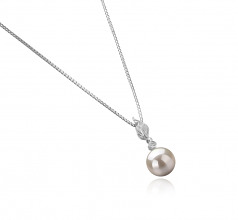 Are you looking for a simple but elegant piece of jewelry? Well, you’ve come to the right place. 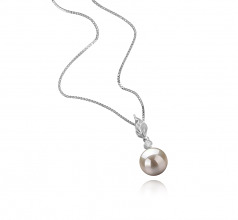 Here we can offer you a beautiful white freshwater pearl and silver pendant that will add a touch of elegance to any outfit in your wardrobe. 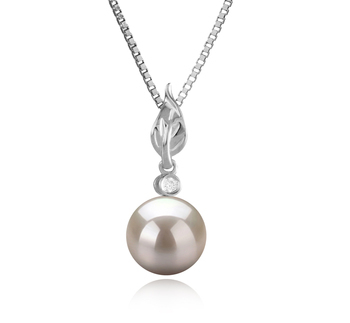 The round AAAA 8-9mm pearl in this piece of jewelry will help to bring out your glamorous side, without too much effort. This elegant item will really help to enhance the look of any outfit that you will wear it with. Don’t be too surprised to find that you love wearing it all the time. If you really want to enhance its elegance even more then think about pairing it with a beautiful pair of freshwater pearl stud earrings and even a small delicate freshwater pearl bracelet. This will not only look stunning when worn with a beautiful black dress but with a smart suit to work. Show only for "Miriah Pendant"